Having trouble tuning your drums? Follow this easy drum tuning guide to get the best sound from your kit. If you're not sure what anything means below, check out the Drum Sound FAQ for definitions. Start from scratch. If you've already got the drumhead on, completely detune it by loosening all of the lugs. You'll have much better results if you start out this way. Clear out any dust/drumstick fragments/other stuff if you take the drumhead completely off! You'll tune the batter (top) drumhead first (the drumhead that you hit). 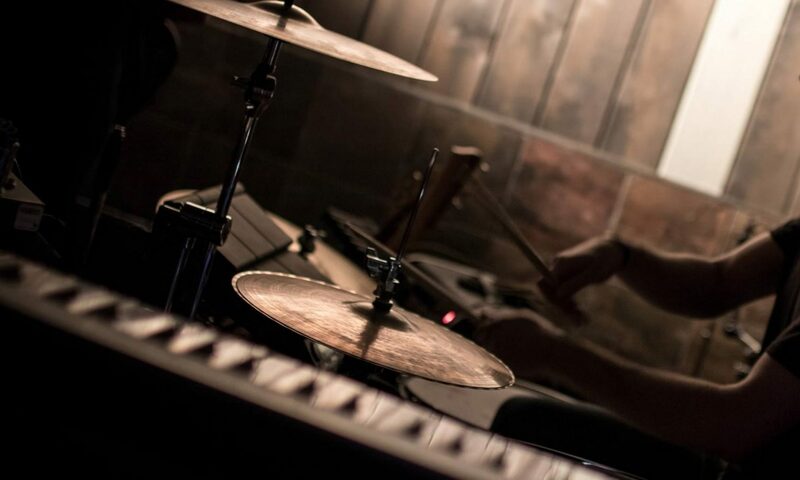 Stop the resonant head from interfering by resting it on the drum stool. If you're tuning the resonant (bottom) drumhead, the same steps apply. Remember to stop the batter side from interfering by resting your drum upside-down on the drum stool. For tuning a resonant snare drum, throw off your snare wires and put your drum stick between the wires and the hoop to keep them from touching the resonant head. Seat the drumhead. Press in the center and around the edge to ensure the head fits snug against the bearing edge. Without the drumhead making good bearing edge contact, it will be hard (or impossible) to tune. Don't worry if the head makes cracking noises, this is normal! If you've removed the drumhead completely, put on the hoop and insert the tuning rods into each lug. Finger-tighten each tuning rod (screw it as tight as you can with only your fingers). Double-check the ones you've already done (they can usually be tightened more)... This ensures each rod starts with the same amount of tension. 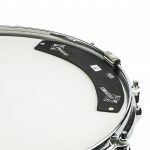 Even tension around the drumhead is the key to good drum tuning! Tighten each rod a 1/4 turn with a drum key. Following the pattern in the diagram below, always tighten the opposite rod from the one you've just turned... Never tighten two rods side-by-side (unless you're looking for a specific sound). 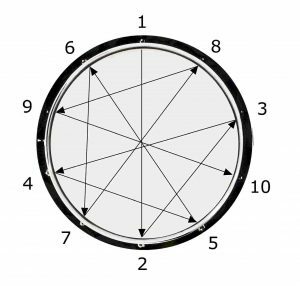 Your drum might have a different number of rods (the one in the diagram below has 10). Dont worry! Just remember to always move to the opposite side of the drum as you're tightening each rod. Listen to the drum as you're tuning it. Each time you've turned all of the rods, check how it sounds. Continue to tighten each rod. 1/2 turns if you're still far from your desired sound, otherwise 1/4 or 1/8 turns as you get closer to the pitch you want. Experiment - if you're unsure of what sound you want, listen to what your drum can do. Find out how your drums sound at low, medium and high tuning. Make small tuning adjustments to even the pitch of all rods (and if there's one pitch you prefer, tune the rest of the rods match). When making small changes like this, you'll usually need to tune the opposite rod the same amount: Usually two opposite rods will share the same pitch (the drumhead is stretched equally between them). This part can be difficult and takes time to master. If you're struggling here, the Tune-bot is an excellent tool to get extremely consistent tuning. Check your sound! Once the pitch is even around the drumhead, check the sound by giving the drum a good hit. If you like it, you're done! If your drum is too high or low in pitch, simply tighten or loosen each rod... Remember to turn each rod by exactly the same amount. Each drum has a sweet spot where it will sound the best. If things sound way off, you may be too far above or below the drum's tuning range. Don't be afraid to experiment here, each drum is different and it can take a little time to find exactly where it sings. Repeat these steps for tuning the resonant head! Tune the resonant head the exact same pitch as the batter head. This gives the most sustain (ringing), which is great for really full sounding toms. Tune the resonant head higher pitch than the batter head. This gives a shorter sustain, and makes the pitch of the drum bend after each hit. Tune the resonant head lower pitch than the batter head. This gives a shorter sustain, and also makes the pitch of the drum bend after each hit. On larger drums, the pitch bend here can be more noticeable. This is completely down to personal preference - test out the different options and listen to how the drum responds. Each drum is different, so find out which of the three options works best for yours. One tip to always remember: The greater the pitch difference between the batter and resonant drumhead, the less sustain (ringing) you'll have. Don't stress if you find yourself completely detuning the drum to start again (this is often better than trying to "fix" an out of tune drumhead). Done all of the above and still struggling to tune your drums? If you're new to drumming it can be frustrating when you just want to play and have a good sounding kit. Spend time learning to tune your drum kit, but also make sure you spend time having fun and actually playing. There are a few options to quickly eliminate strange ringing and overtones, tune your drums more accurately, or control your sound, giving you more time actually playing. Some drumheads are just easier to tune. 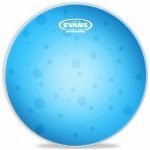 Try thicker drumheads with some form of sound control like the Evans Hydraulic, Remo Pinstripe, Evans EC2S, or the Aquarian Super 2 with Studio X-Ring. These drumheads are more controlled, warmer, and more durable, but they lack sensitivity and character (especially at lower volumes). 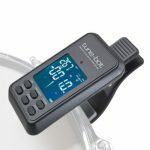 Tuning accessories are available to help you tune your drums much more accurately, like the Tune-bot or DrumDial. These give precise measurements of your drumhead tension, and give you suggested settings for specific drums and sounds. Dampening and sound control accessories can help reduce strange drum ringing and eliminate unwanted overtones. Moongels are incredibly popular for this. There are also o-rings, bass drum mufflers, and more extreme sound changers like the Big Fat Snare Drum. Don't overdo it, and try to use these things to complement your sound rather than covering up for poor drum tuning. Check the bearing edges of your drums. 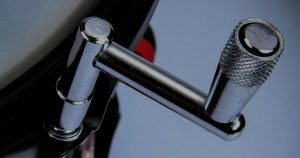 If your bearing edges are damaged, you'll have a very hard time tuning your drum set no matter what you do. Before putting a new drumhead on, take a look around the bearing edge (where the drumhead makes contact with the drum shell). Tiny bumps or dips here may affect the sound a little, and you will have big tuning problems if there are large areas where the drumhead can't make contact with the drum shell. Get the bearing edges re-cut by a professional if needed. 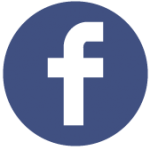 to learn about the factors influencing your drum sound. Knowing exactly how things combine to influence your sound will help you figure out what you need to target to get the sound you want. Crank your drumhead up to see how far it goes before you completely lose the sustain. Tune it all the way down to see how low it can go. Try out different batter and resonant head tuning combinations. Learn how the different drumhead variables influence your sound. Spend time to get it right.